Grandfather, Papa, Nonno, Dziadek, Father, Dad ,Brother, Son no matter what you call them prostate cancer affects them all. • Prostate cancer is the most common cancer to afflict Canadian men. 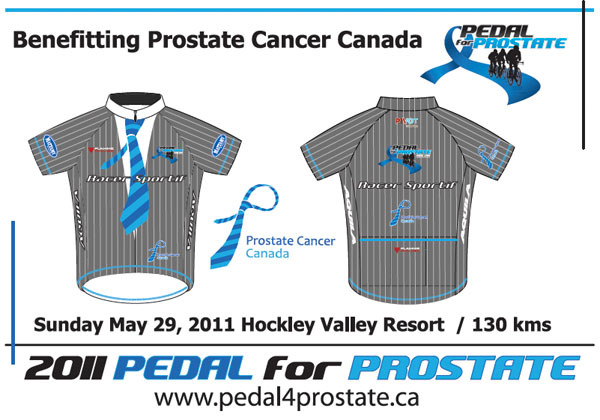 The first annual Pedal for Prostate ride will be taking place on May 29th, 2011 to benefit Prostate Cancer Canada. Participants will ride through scenic Hockley Valley in Ontario in a 100 km or 150 km loop. Registration is $200 with at least 50% of the proceeds going towards Prostate Cancer Canada and includes a BBQ lunch and jersey for the first 200 registrants. Additional donations are optional and can be made through www.pedal4prostate.ca.